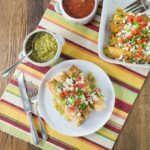 Baked Mexican Three Cheese Flautas is the perfect dish to serve your family and friends for any occasion. Crunchy, creamy cheese flautas topped with tangy salsa verde, tomatoes and crumbled queso blanco. In a bowl mix Gouda, queso blanco and Cotija. Add pepper and nutmeg and mix well. Stir in the cilantro. Add beaten egg to the cheese mixture and mix well. Evenly divide the cheese and egg mixture onto the end of each tortilla shell. Roll up tightly to form a cigar shape, and secure with a toothpick. Heat oil, and pan fry flautas until brown on all sides. Place flautas on the bottom of a 9"x12" baking pan. Pour the Pace® Salsa Verde over the top of the flautas. Sprinkle queso blanco over the top. Remove from the oven and pour 1/2 cup Pace® Salsa Verde on top. Sprinkle with tomatoes, green onions and drizzle with sour cream.